Browse » Home » assam , assam government jobs , District Agricultural Officer Goalpara , jobs in assam » District Agricultural Officer, Goalpara Recruitment 2018 - Jr. Assistant. & Peon. 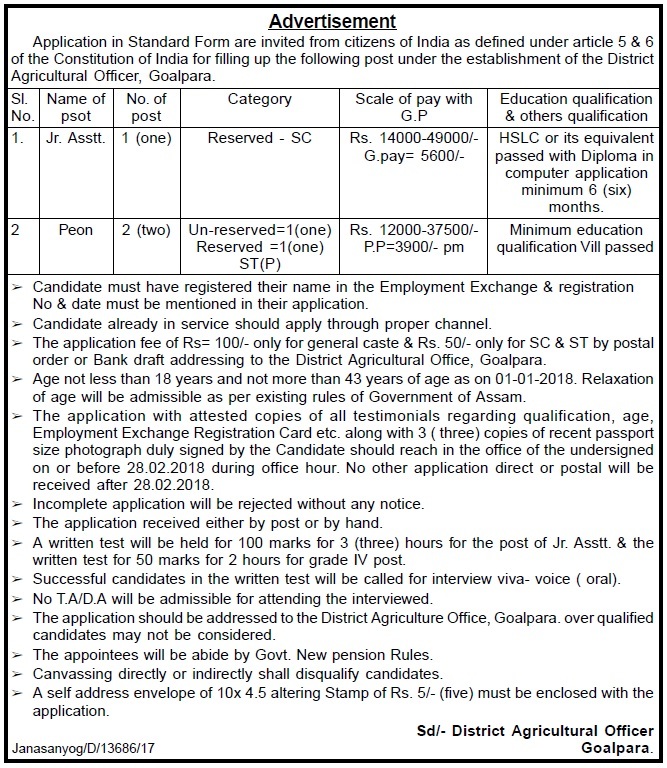 District Agricultural Officer, Goalpara Recruitment 2018 - Jr. Assistant. & Peon. Organisation Name: District Agricultural Officer, Goalpara. Application in Standard Form are invited from citizens of India as defined under article 5 & 6 of the Constitution of India for filling up the following post under the establishment of the District Agricultural Officer, Goalpara. 1. Candidate must have registered their name in the Employment Exchange & registration No & date must be mentioned in their application. 2. Candidate already in service should apply through proper channel. 3. The application fee of Rs= 100/- only for general caste & Rs. 50/- only for SC & ST by postal order or Bank draft addressing to the District Agricultural Office, Goalpara. 4. Age not less than 18 years and not more than 43 years of age as on 01-01-2018. Relaxation of age will be admissible as per existing rules of Government of Assam. 5. The application with attested copies of all testimonials regarding qualification, age, Employment Exchange Registration Card etc. along with 3 ( three) copies of recent passport size photograph duly signed by the Candidate should reach in the office of the undersigned on or before 28.02.2018 during office hour. No other application direct or postal will be received after 28.02.2018. 6. Incomplete application will be rejected without any notice. 7. The application received either by post or by hand. 8. A written test will be held for 100 marks for 3 (three) hours for the post of Jr. Asstt. & the written test for 50 marks for 2 hours for grade IV post. 9. Successful candidates in the written test will be called for interview viva- voice ( oral). 10. No T.A/D.A will be admissible for attending the interviewed. 11. The application should be addressed to the District Agriculture Office, Goalpara. over qualified candidates may not be considered. 12. The appointees will be abide by Govt. New pension Rules. 13. Canvassing directly or indirectly shall disqualify candidates. 14. A self address envelope of 10x 4.5 altering Stamp of Rs. 5/- (five) must be enclosed with the application.